When people speak of burns, they are generally talking about skin that has been damaged through exposure to heat. However, the term “burn” can also be applied to damage caused by cold, such as “freezer burn” or mild frostbite. Cold burns are caused by prolonged contact with icy objects or snow or exposure to wintry conditions. The drop in temperature causes the water contained in the cells to freeze, forming sharp ice crystals and damaging the surrounding cell structure. 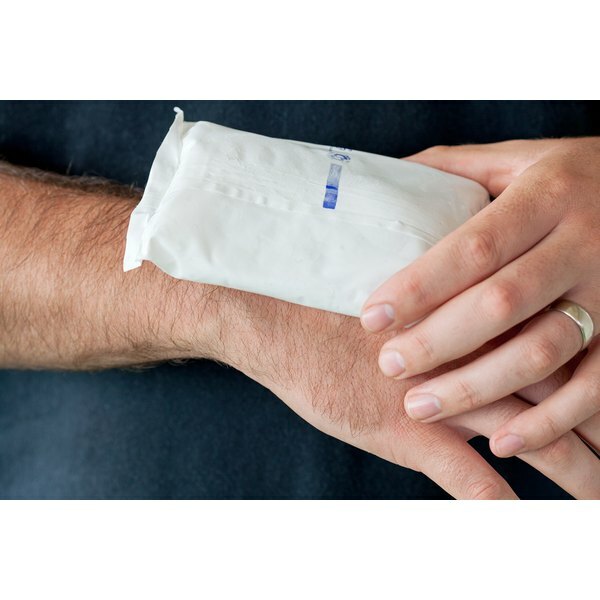 One of the most common ways this can occur is through the application of an ice pack to an injury. If you suspect you have burned yourself with an ice pack, begin by visually inspecting the area and evaluating the extent of the damage. If the skin is tingling and red, you can safely proceed with home treatment. Also, if the area is numb, but you experience a pins-and-needles sensation as it begins to warm, you have not sustained permanent damage and can continue with self-care. However, if the area is white, cold and hard when you touch it and if it then becomes red and swollen as it warms, you need to seek professional medical assistance. This type of injury is generally followed by the formation of blisters and permanent "bruising" or skin discoloration, which indicates lasting damage and possible destruction of the blood vessels. The affected areas need to be rewarmed, but this must be a gradual process or you will unintentionally inflict further harm on already delicate tissues. Submerge the burned skin in lukewarm water, between 104 and 107 degrees Fahrenheit. Do not move or massage the damaged areas, as this can cause subcutaneous ice crystals in the tissue to move and do further damage. Leave the injured skin underwater for 15 to 30 minutes, or until the skin is pink, soft and pliable again. If the temperature of the surrounding water drops below 100 degrees Fahrenheit, reheat it and resubmerge the affected area. This thawing process may be painful. An over-the-counter pain medication, such as ibuprofen, may be taken to ease discomfort. Once the skin surface has returned to a normal temperature, apply a generous coating of aloe vera or honey to the burned area and cover it loosely with gauze. Both of these substances help the skin to retain moisture and increase the rate at which new skin cells are formed, decreasing recovery time for burn victims. In the future, should you feel the need to place an ice pack on an injury to help reduce the swelling and inflammation, wrap the pack in a towel first; do not apply it directly to the skin. Leave it in place for 10 to 20 minutes at most as any longer application drastically increases the risk of injury.